The collect and readings for the Feast of the Ascension may be found here. The following sermon is based on Acts 1:1-11 and Luke 24:44-53. We live in a world in which up is better than down. Singers want to be at the top of the charts, athletes want to be on top of their game, and students want to be at the top of the class. Everyone would rather have an up day than a down day. When the stock market rises we celebrate but despair when it crashes down. No one wants to be at the bottom of someone’s list. We work to climb, not to descend the career ladder. We hear and read about mountain climbers but not much is said or written about valley descenders. Recently, the three year old class at our parish school has delighted in showing me how high they can jump and, at least for a moment, defy gravity. The reality is that we want to live ascended lives. We want to break free from the things that hold us down and rise above it all. There’s nothing wrong with that. In fact, it is right. Something within us knows that we are more than earthbound creatures. The problem is that we have distorted what ascension and an ascended life mean. We forget, or perhaps deny, that Christ’s ascension seats humanity next to God, and settle for attempted self-ascension. That distortion has invaded our theology and understanding of God. In this distorted view God, heaven, and holiness are up there somewhere while we are stuck down here. So we spend our time jumping up and down like little children thinking if we jump hard enough, high enough, and fast enough we can touch the moon. This gets lived out in so many ways. It almost always involves comparison, competition, and judgment of some kind. We compare ourselves and our lives with other people and their lives. We compete with each other believing that for us to ascend the other has to descend or at least not jump as high as us. We are forever judging ourselves and one another. We fill our lives with busyness hoping to climb to new heights. 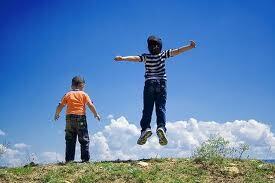 A life of self-ascension keeps us always searching for the next high. Our attempts at self-ascension fragment our world and our lives. They separate the creature from the creator. They destroy relationships and intimacy. Ultimately, they become the gravity that deny us the ascended life we are seeking, a life that, in reality, is already ours. Jesus’ ascension reshapes our disfigured understanding of an ascended life. His ascension is the corrective and antidote to the fragmentation and separation of self-ascension. His is the only authentic and life-giving ascension. Through him we too can live ascended lives. The ascension of Jesus completes the resurrection. The resurrection is victory over death. 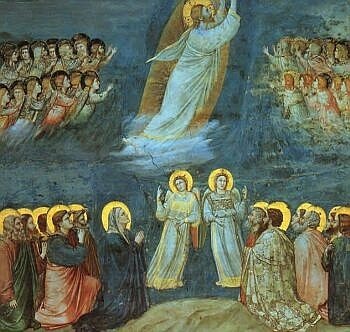 The ascension, however, lifts humanity up to heaven. Jesus’ ascension seats human flesh, your flesh and my flesh, at the right hand of God the Father. We now partake of God’s glory and divinity. What do we need to let go of? Fear, anger, or resentment often weigh us down. The need to be right or be in control is a heavy burden. For some self-righteousness, jealously, or pride is their gravity. Many of us will be caught in the chains of perfectionism and the need to prove we are enough. For others it may be indifference or apathy. Far too many lives are tethered by addiction. Gravity takes many forms and I wonder, what is the gravity that denies you Jesus’ ascension? The gravity that keeps us down is not creation or the circumstances of our lives. Gravity is not around us but within us. So as you begin to look at your life and identify the places of gravity, do not despair. The very things that hold us down also point the way to ascension. Our participation in Jesus’ ascension begins not by looking up but by looking within. David, thanks for the link. The way down is the way up; descent is the means of ascent. I think we are always trying to learn and practice this. It is opposite to what most of society tells us. Yet, it is the pattern of Jesus’ life. This is marvelous, Michael. Well thought out and articulated with a spirit of generosity. Thank you! Penny, thanks for your encouraging words. I hope your Ascension Day was blessed and holy.